The 1979 film, The Amityville Horror , tells the true-life story of George and Kathy Lutz, a couple who moved into a house one year after an entire family had been murdered there. The film is based on a novel by Jay Anson that claims that the Lutz family fled from their Amityville, NY house after being victimized by ghosts. 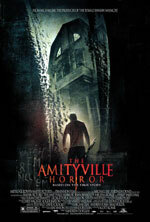 The Amityville Horror has now been remade as a film directed by Andrew Douglas and written by Scott Kosar. Kosar developed his own storytelling approach for the remake. "With Amityville, I liked the challenge of retelling a classic haunted house story in a way that would frighten a contemporary audience," he says. "This version...relies less on special effects and more on psychological horror." Producers Andrew Form and Brad Fuller wanted to base this version on the true-life events that make the Lutz family's experiences so interesting. "We knew [Scott Kosar] would dig as deep as humanly possible to make sure the story we were telling was compelling and truthful," Form explains. Kosar's screenplay for The Amityville Horror draws direct parallels between George Lutz and Ronnie DeFeo, who murdered his entire family in the Amityville house before George bought the house. "...I focused on....how the malefic spirits in the house were leading George down the same road that Ronnie followed to his doom," says Kosar. becomes one with the house." Producer Andrew Form agrees. "[The house] starts to have a physical effect on [George]," says Form. "The closer he gets to the basement, the more extreme his physical symptoms become and the more severe his personality changes." In the film, George Lutz suffers from a form of demonic possession. He menaces his family, and his wife, Kathy, must protect her children from him. To portray Kathy in a convincing way, actress Melissa George made friends with the young actors who portray her onscreen children. "I spent a lot of time getting to know the kids....and basically pretending they were my own children," she says. For Melissa George, the supernatural events that the Lutz family experienced in the Amityville house are believable. "...I started to research and read what [the family] went through," she says. "They must have seen something.... They left and never came back."